I was just doing a little blog surfing this morning (you know, instead of keeping up with my 30 Days series, which I hope to catch up on TOMORROW) and found out about a nice giveaway. I enter giveaways all the time, and even find some resources worth purchasing whether or not I win. Recently I have found out about a Children's Illustrated Bible Dictionary and a kid-size Theology book (wish I could remember where I saw that one). 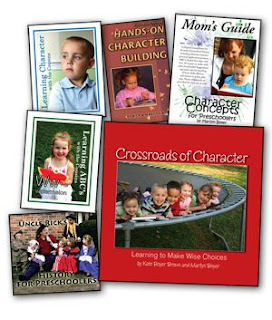 Just now I found a giveaway for a Character Development Curriculum for Preschoolers. I thought it would be cool, and I entered to win. Then I actually went to the publisher's site and checked it out a little more thoroughly. IT LOOKS AWESOME. So, while I secretly hope you do NOT enter the giveaway to increase MY chances of winning, I would also love to hear that one of my readers went there and won it. Seriously. I am not a homeschooling mom, but I have kids. And this content is not included in what they teach in public school. It's a preschool curriculum, but Sarah Mae says it would be easy to make it multilevel. I would do that if we had a copy of it at our house. So, here's the link to the giveaway. In it you will find access to the publisher website to find out more. Yup I already tweeted and retweeted and commented. That's all I'm gonna do. If I get it - I'm giving it away - so if I win and you know someone who needs it - it's yours - so it can be theirs. That would make God smile. See - I told you - I knew I'd like it here. A break from your headlong dash through the Word of God - that's fine - got to come up for air sometimes. I heart your words and hope I never forget what brought me here. Your not so random act of kindness in that story bleed twitter chat.